The air is heavy with the desire for authentic experiences. We’ve had enough of the standardised products that the world of commerce offers us. “Cook your own shoes! Dream and spice it up as you please. This is your art and your invention” - that’s the Puma “Mongolian Shoe BBQ” website. Puma cleverly responds to the demand for exclusive authenticity. On the web, you can enjoy yourself sitting at a rather worn wooden table in a picturesque restaurant, and with the assistance of a handsome maître chef from Mongolia you can put together your own exclusive Puma shoes from a buffet of thirty different kinds of materials, colours, textures and types of leather. The personal touch and involvement have now come to join brand name and extravagant price as components of the cult of exclusiveness. You no longer go to a shop to buy something -– as in the anonymous supermarket – but you set out in search of personal, authentic experiences. We want to be waited on, preferably by skilled and elegant specialists who are capable of tracing the very best in the archives of history, an exquisite wine region or an outstanding design academy. It’s like classical music – you prefer not to play on synthetic strings. There’s nothing above hearing the sigh of the natural string made of catgut. When the musician plays it at its best, the instrument should suffer. 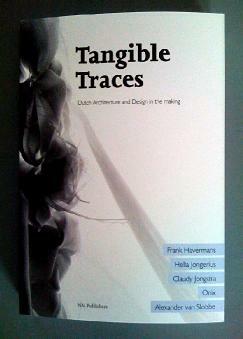 In: Tangible Traces edited by Linda Vlassenrood. Nai Publishers, Rotterdam, August 2009. The Tangible Traces exhibition will take place from the 4th of December 2009 to 28th of February 2010, at the Museum of Modern Art in Arnhem. How do architecture and design take on meaning in a world that has become uniform as a result of globalisation, standardisation and commercialisation? 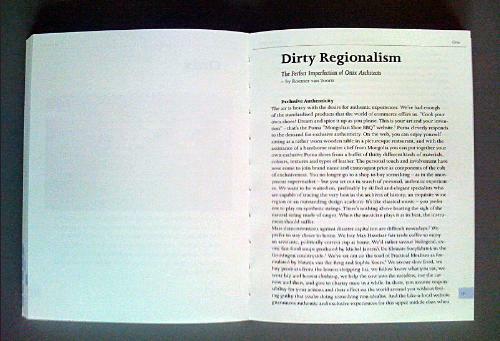 By embracing unmodern notions such as craftsmanship, tradition and context. These notions are the links between the work of spatial designer Frank Havermans, industrial designer Hella Jongerius, textile designer Claudy Jongstra, the architecture office Onix and fashion designer Alexander van Slobbe.